Finally put a fashion week outfit together after two weeks of putting it off. I wore this to... actually nowhere. Okay I wore this to stay inside all day and dance to my Clash record. I would be very concerned if I didn't know me! Zara shirt, random black top, Brandy Melville trousers and weekday socks. I look like a stubborn toddler here. Dailylookz ootd. 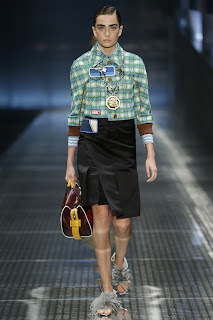 Inspired by that ss17 Prada collection, I wish I had multicolored belts and slightly longer hair and furry slippers. As you can see in the pictures I have no clue how to make this work, but I liked wearing this anyway? 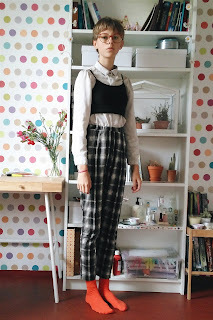 I really enjoy doing these outfit posts again. 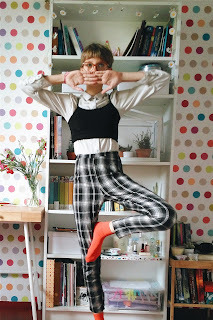 And I really enjoy wearing these plaid trousers. Okay I should be doing my homework right now (mom I know you're reading this I am procrastinating for a good cause okay) so see ya later!